Clint Eastwood took the stage at the Republican convention last week and gave a… well, let’s call it a memorable performance. I’m not sure if there’s ever been such a bizarre prime time address given at a national convention. The celebrated actor/director spent eleven minutes in a mumbling debate with an empty chair representing President Obama. Political conventions are highly-scripted events. Eastwood’s extended, failed ad lib was anything but scripted. In years past, such a performance would have provided fodder for late-night comedians, but little more. Saturday Night Live and Letterman could weigh in, while you and I were left to passively chuckle. Living in the age of social media, events unfolded at a different pace and among different participants. 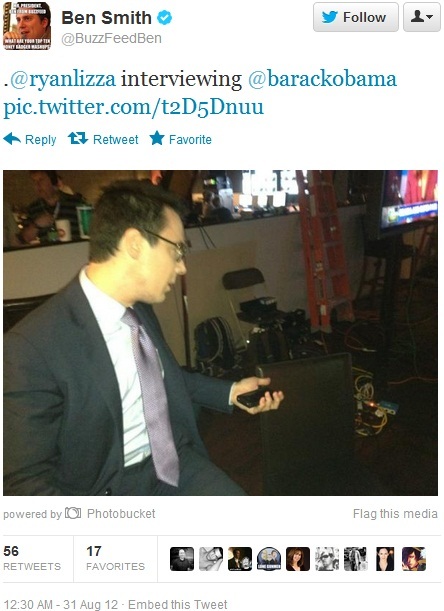 Within minutes, an anonymous Twitter user registered the name @InvisibleObama. Conjuring shades of @MayorEmanuel, the participatory features of the hybrid news environment allowed formerly-passive members of the audience to swap jokes. That evening, Twitter users launched a new hashtag, “#eastwooding,” wherein individuals post pictures of themselves pointing at empty chairs. Thusly a new “meme” was born. Within less than a day, @InvisibleObama has attracted over 55,000 Twitter followers. Newsweek/DailyBeast has posted an #Eastwooding “best of” list. CNN covered it as well. Participatory engagement with Eastwood’s odd performance made itself became the subject of news. This is all in good fun, of course. Twitter during national events adopts the texture of a giant Mystery Science Theater 3000 episode. But in the course of this distraction, one might wonder, does it actually make any difference? I would argue that political memes and twitter games like #eastwooding have a very specific, but very limited, effect. 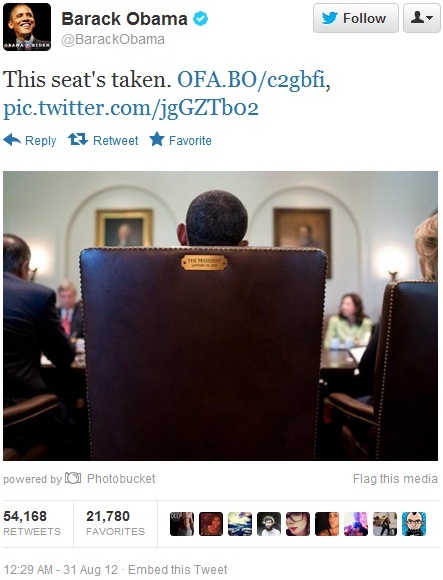 Let’s start with the obvious limitations: @InvisibleObama and #Eastwooding will have no direct impact on the outcome of the 2012 election. These are games played by the already-politically-engaged. 55,000 Twitter followers is a drop the ocean compared to the ~38 million total viewers of the Republican National Convention, or the 100 million+ citizens who will cast a vote in the November election. Individuals who #Eastwood are among the most attentive segments of the populace. They’re also more likely to be liberal. Conservatives have taken to defending Eastwood’s display as counter-intuitively good for Romney. #Eastwood’ers have already made up their minds, and they each only have one vote. Secondary effects are also pretty limited. Politically-aware Twitter users tend to be connected to one another (social network theorists call this phenomenon “homophily”). We should not expect individuals who chose to ignore the RNC convention to pick up on it after-the-fact due to social media chatter. Furthermore, memes of this sort have a pretty brief half-life. With the Democratic National Convention scheduled for this week, the hybrid media system will quickly turn its attention to a new set of images and statements. One impact of new media on political news is that the “churn” of the news cycle has sped up. Congressman Todd Akin’s outlandish claims about female biology already seem part of the distant past. By the time of the October Presidential debates, #Eastwooding will have been replaced a half-dozen times. We shouldn’t expect it to be on anyone’s mind when they enter the voting booth. That said, the limited size and duration of these Twitter memes doesn’t render them useless. In very particular ways, this participatory nature of the new media system has an important effect on media and politics today. BuzzFeedBen is Ben Smith, formerly of Politico.com, current editor-in-chief of Buzzfeed.com. Ryan Lizza is an accomplished political journalist whose work has appeared in The New Yorker, The New Republic, The Atlantic, and Vanity Fair. Other journalists, such as Slate’s Dave Weigel, also joined in the fun. These journalists aren’t revealing some hidden liberal bias through their actions; they are revealing a participatory bias. A small segment of the US population pays a lot of attention to politics. The hybrid media environment allows journalists to engage with these attentive citizens. The interactions can help shape news coverage, or (in cases where the media runs stories on #Eastwooding) become the subject of news coverage. Rather than writing about the policy details (or lack thereof) in Romney’s acceptance speech, many news outlets turned instead to Eastwood’s odd performance, and the global audience’s playful reaction. This changes the texture and content of media coverage. The Internet didn’t cause this merger of news and entertainment. It began in the 1980s, as newsrooms sought higher ratings and larger profits. Political communication scholars raised concerns about “infotainment” before the average citizen owned a modem. Twitter isn’t the cause of this merger; it is merely the latest iteration. The limitations of these incidents are likewise nothing new. Everyday political gaffes don’t determine the outcome of a national election. Today’s media environment churns faster, so we see more of the gaffes. It is also more segmented, so those of us who aren’t interested in seeing them can tune out more easily. Cases like #Eastwooding provide a variation on these longstanding trends. American politics has accepted the blurring of political news and political entertainment. Social media provides a participatory element, making the entertainment aspects much more entertaining. David Karpf is an Assistant Professor in the School of Media and Public Affairs at George Washington University. 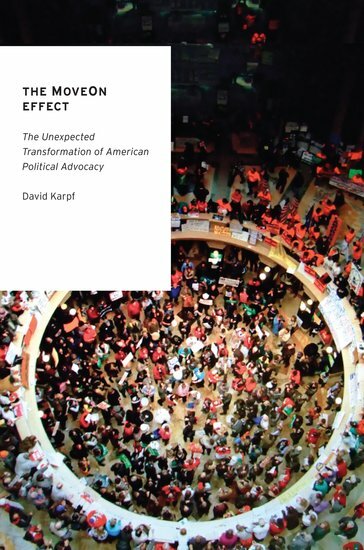 He is the author of The MoveOn Effect: The Unexpected Transformation of American Political Advocacy. His research focuses on the Internet’s disruptive effect on organized political advocacy. He blogs at shoutingloudly.com and tweets at @davekarpf. Oxford University Press USA is putting together a series of articles on a political topic each week for four weeks as the United States discusses the upcoming American presidential election, and Republican and Democratic National Conventions. Our scholars previously tackled the issues of money and politics, and the role of political conventions. This week we turn to the role of media in politics. Read the previous article in this series: “Networked politics in 2008 and 2012.” And you can see OUP’s contribution to #Eastwooding on Google Plus. Image credits: Both screencaps were taken on 4 September 2012 at 11:11 am ET.